​Tomie Arai's art helps us construct a sense of who we are as individuals, as a society, or as a nation. She questions stereotypes and conventions while exploring attributes such as gender, sexuality, race, nationality and heritage. She uses interdisciplinary, collaborative methods to illuminate intersectionality. Her work makes a strong case for the idea that art and artists play key parts in the process defining, depicting and respecting cultural identities. context, been considered stereotypically feminine and therefore trivial. Arts Council, the MTA Arts for Transit Program, the New York City Board of Education and the San Francisco Arts Commission. Her public works are both monumental and personal, while her artist books provide a more immediate, in-hand contemplation of the construction of cultural and personal identity. These pieces are permutations of traditional forms, using paper wood, glass, and printed images to construct objects that are both intimate and surprising. Aria's artist books evoke the experience of discovering a forgotten treasure in the attic, an old piece of silk or cache of letters, something that reveals a previously untold story. MidAtlantic Arts Foundation and the NEA. She was a recipient of a 2003 MCAF grant, a 2007 Urban Artists Initiative Grant, a 2007 Arts and Activism grant from the Asian Women Giving Circle and a 2013 Puffin Foundation grant. was not "me." Although at the time I lacked sufficient awareness in feminist theory to articulate my particular gender identity exactly, I was already self-consciously rejecting the kind of girly femininity society imposes on young girls. movement. It is a standard piece of hardware fastener. In appearance it is thick and curvy; it is hard and smooth to the touch. Aesthetically it is multi-functional, plain and minimalist rather than frivolous and ornate. It gives the impression of a strong DIY attitude--what de Bretteville described as "strength without a fist" when she gave Chicago and Raven the first eyebolt necklaces she had designed in 1972. As a tangible piece of visual communication, de Bretteville's eyebolt necklace embodies a feminist femininity that I can proudly wear rather than hide in a drawer. I get a sense of satisfaction knowing that if I ever lose my necklace I can find its replacement at the local Home Depot rather than have to set foot in a jewelry store. Wearing the necklace I feel solidarity with other women, particularly with its designer, who is an exemplary role model for women arts educators such as myself. Over the course of my career as an academic I have been part of revamping the curriculum of two large interdisciplinary studies programs. Both times the processes involved were labor intensive. Nevertheless, these efforts seem to me paltry compared to what de Bretteville has accomplished. De Brettville, in addition to her graphic design studio practice, founded the first design program for women at Cal Arts in 1971 before starting up the aforementioned programs at the Women's Building in 1973. She somehow managed to spearhead these monumental projects as the mother of a young child. 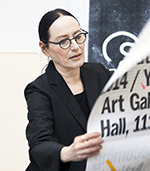 In 1981 she initiated and founded the Department of Communication Design at Otis/Parsons. 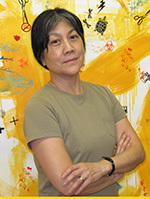 In 1990 she moved to Yale, where she was joined the faculty as the first tenured professor in its School of Art. In 2010 her accomplishments were formally acknowledged at Yale as she was named an endowed chair, the Caroline M. Street Professor of Graphic Design. I missed my chances to meet Professor de Bretteville back in 2009 when she honored Joyce Kozloff at the WCA Lifetime Achievement Awards Ceremony, and again in 2011 when I was asked to contribute to the \exhibition catalogue for Doin' It In Public: Feminism and Art at the Woman's Building that was organized by the Ben Maltz Gallery at Otis College of Art and Design October 1, 2011-January 28, 2012. I declined because at the time I was busy with WCA's exhibition Man as Object: Reversing the Gaze that was held at SOMARTS in November 2011. I keep telling myself that it is impossible to do it all, but de Bretteville seems to have repeatedly proven me wrong. One only has to take a cursory glance at her website to be amazed by her extraordinary feminist vision and enormous talent as a graphics artist and designer. that you, dear reader, will join me in honoring her at the WCA Lifetime Achievement Awards Ceremony in Washington DC on February 4, 2016! ​Helene Aylon is a visual, conceptual, and installation artist and an eco-feminist whose work has been exhibited around the world. Through her art, she has explored the intersectionality among her feminism, the Orthodox Judaism of her upbringing, and her place in a war-torn world. Brooklyn and received an orthodox Jewish upbringing. At the age of 18, she married a rabbi to whom she had become engaged while still in high school. She bore two children and was only 30 when her husband died of cancer. Prior to her husband's death, Aylon enrolled as an art student at Brooklyn College, where she studied under Ad Reinhardt. After finishing college, she was commissioned to paint a mural for the youth employment center in the Brooklyn neighborhood of Bedford-Stuyvesant. When photographed for a newspaper article, she said that her name was HelÈne Aylon, in which she used the Hebrew equivalent of her first name as her surname. She subsequently taught at San Francisco State University and California College of Arts and Crafts in Oakland. Aylon's first notable work, Rauch (Spirit, Wind, Breath) (1965), was a 16-foot mural, commissioned for the now-defunct Synagogue Library at JFK International Airport, that attempted to portray Judaism through the eyes of women. Her work can be divided into three phases: Process art (1970s), anti-nuclear art (1980s), and The G-d Project (1990s and early 2000s), a feminist commentary on the Hebrew Bible and other established traditions. Aylon's earliest exploration of process art was done in California in the 1970s. She created a series called Paintings That Change (1974-77), which included Tar Pouring, Drifting Boundaries, Receding Beige, and Oval on Left Edge. All of the works consisted of oil on paper which would slowly transform as the oil moved, relying on chance. By the 1980s, Aylon, was a self-described eco-feminist. She began to create anti-nuclear and eco-activist art, which included Earth Ambulance (photo right). This work consisted of an "ambulance" (a converted U-Haul van) that symbolized an attempt to save the world from nuclear war. Using the Earth Ambulance, Aylon gathered dirt from Strategic Air Command nuclear bases, uranium mines, and nuclear reactors from across the United States. She stuffed the dirt into pillowcases and used them in a demonstration at the United Nations during the Second Special Session on Nuclear Disarmament on June 12, 1982.
shelves along a wall, adjacent to the five books of Moses, and used a pink highlighter to mark phrases that, according to her, convey patriarchal attitudes. She also targeted words or phrases that conveyed a sense of vengeance, deception, cruelty, and misogyny that had been falsely attributed to God. The work was first exhibited in Too Jewish? Challenging Traditional Identities at the Armand Hammer Museum of Art in March 1996. During the exhibition, Aylon formally invited area rabbis to visit and discuss her work. forbidden on a Beit Din, the Jewish court of law, can now judge. Chamber: My Marriage Contract. The latter is a simple bed covered in a white bedspread that Aylon constructed from handkerchiefs and a wedding canopy. Around it are four columns with superimposed projetions of photographs that show the artist in her wedding gown. Behind the headboard, Aylon wrote quotes from Leviticus concerning women's "uncleanliness" and "impurity." The work was meant to be a comment on marital and religious constraints felt by woman. In 2002, Aylon created The Partition is in Place, but the Service Can't Begin, a comment on the segregation of male and female worshippers in the synagogue. As noted by Aylon, "The material I thought appropriate for the Partition that separates male and female worshippers is made of the ritual garb worn by religious men. But if there were nine male worshippers and one thousand female worshippers, the service could not begin because the service requires the presence of ten men." against humanity. My prayers are with the people of Paris." She is a strong community member and a citizen of the world. Guzman does well by doing good. Undertaking initiatives, immersing herself in direct service through her work in the arts and as a business woman, Guzman models a life worth living. She had been the Vice President at the National Museum of Mexican Art (NMMA) in Chicago for 13 years. The mission of the museum is "to showcase the beauty and richness of Mexican culture by sponsoring events and presenting exhibition that exemplify the majestic variety of visual and performing arts in Mexican culture." Guzman was credited with expanding and promoting that mission. The NMMA is the only Latino museum certified by the American Alliance on Museums. Visitors are offered a chance to "immerse [themselves] in the richness of Mexican art and culture right in Chicago." Showing over 3,000 years of work from North and South of the border and engaging people in the diverse culture, this museum welcomes old and young alike with classes, camps and mentorships. 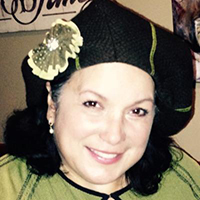 Since the 80s, Juana Guzman devoted her energy and love of life and art by serving as the arts director, earned income specialist and consultant to non-profits in governmental and philanthropic arenas. Guzman focuses on social change and promoting the art, culture and heritage of diverse groups across the boundaries of age and ethnicity. creating a basis for economic and social growth. sources, helping non-profits develop entrepreneurship and tourism. Her company, I Juana Know, focuses on bringing creative solutions for diverse communities, including bringing enhanced revenue to creative markets. For more information go to www.ijuanaknow.com. communities by promoting art, awareness and entrepreneurship for artists and communities across the states.